Horses are naturally skittish, so introducing a dog to a horse can be an interesting event. 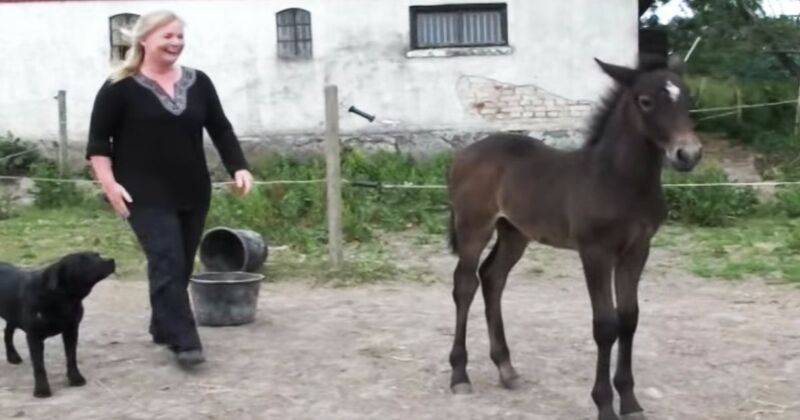 When this young foal first meets this dog, he's not at all sure about how to handle the situation. But with a little time, the foal settles in; the dog starts to mind his own business, and the foal even feels comfortable enough to play around a bit. Dogs and horses can learn to get along, but it's so important to keep them both safe as they're getting to know each other. According to Horse and Rider, it's best to introduce a dog to a horse when the dog is young. However, you should realize that some dog breeds get along with horses better, but a dog's individual temperament can also play a role in how a dog ultimately acts around horses. If you're adopting or buying a dog, be sure to ask the dog's owner about his temperament, whether he's skittish around animals, and if he is ever aggressive, especially when nervous. When you first bring your dog to the barn, make sure that he is on a leash. Walk him around so that he can see the horses and get familiar with the area. Spend some time so that your dog feels comfortable around the smells and sounds of horses. When it's time for your horse and your dog to meet, put your horse in a pasture or round pen so that he can move away from you if he wishes. Bring your dog into the area while he's on a leash, and watch his reaction as you get closer to your horse. If your dog takes the meeting in stride, praise him. If he acts aggressive, say "No" firmly and wait until your dog peacefully greets your horse, then praise him. If you have trouble introducing your dog to your horse, you may need to consult a dog trainer. It's important that your dog learns how to be safe around your horse, especially if you plan on bringing him to the barn in the future.